Sofia Coppola's The Beguiled is one of those films I find frustrating because there is so much I responded to and yet so much that was confounding me at the same time. The film's flaws were too glaring to be overcome by the film's strengths and I end up feeling disappointed at the promise which is somewhat squandered. 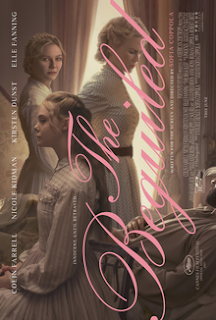 Coppola crafts a very tight, judiciously edited take on the story which has been told previously. This is the story of how sexual repression leads to a devolution of morality when temptation is thrown into the mix. It's a fascinating idea but I found Coppola's sparse approach to the tale did a disservice. She is so focused on the economy of her story telling, her film feels short changed, the emotions never earned, the positions assumed. What I mean is that she rushes her take, focusing on plot point after plot point, without building up sufficient emotion or feeling to then make the reactions of her characters feel honest or real. I appreciate succinct story telling but the story still needs to generate organic feeling emotions, motivations, and perspectives. I didn't feel much of that here. Instead it felt like Coppola just expected us to go along with whatever action or reaction her characters were taking. Man shows up to a house full of isolated women who live in a morally strict culture. They all immediately start fighting over his attention. He acts on his desire with one of them. Panic ensues. Violence breaks out. Choices are made. It all just happens so fast. It all felt so by the numbers. I would have loved it if Coppola had taken the time to show us under the skin of each character, to get inside their heads and hearts so we could feel what they were feeling. The tensions which are necessary to sell this story need to be palpable, not just thrust upon us. When Colin Farrell's character turns to rampage it felt out of the blue and unrealistic. And then there is the issue of the film removing the black characters which are a part of the source material. Coppola's excuse is that she didn't want to present black characters in a surface way, but my problem is she could have chosen not to present any of her characters in a surface way. The issue of slavery intersecting with the gender politics could have added a richness the film is lacking. The film is beautifully shot and lushly decorated. But the characters feel far less fleshed out. It is a bit of a wasted opportunity.